Brain lobes and anatomy. Artwork of the human brain in profile (front of brain at right), with colours showing the different regions (lobes). 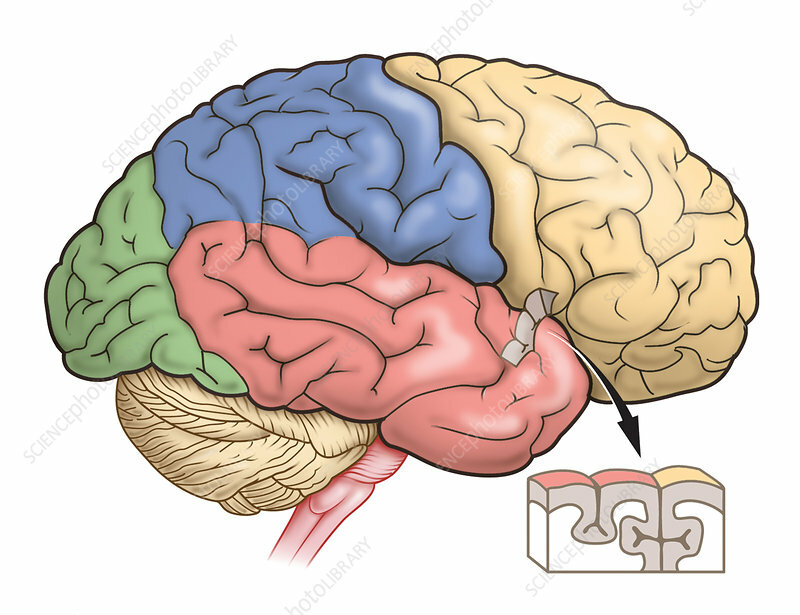 These are: the frontal lobe (yellow), the parietal lobe (blue), the temporal lobe (red), and the occipital lobe (green). The cerebellum is at lower left, with the brainstem to its right. An inset (lower right) shows the sulci (folds) that increase the brain's outer surface area. The frontal lobe deals with conscious thought. The parietal lobe integrates sensory information and object manipulation. The occipital lobe processes vision. The temporal lobe handles smells, sounds, and complex patterns.